Is there a better alternative to Sciatrope? Is Sciatrope really the best app in Science category? Will Sciatrope work good on macOS 10.13.4? 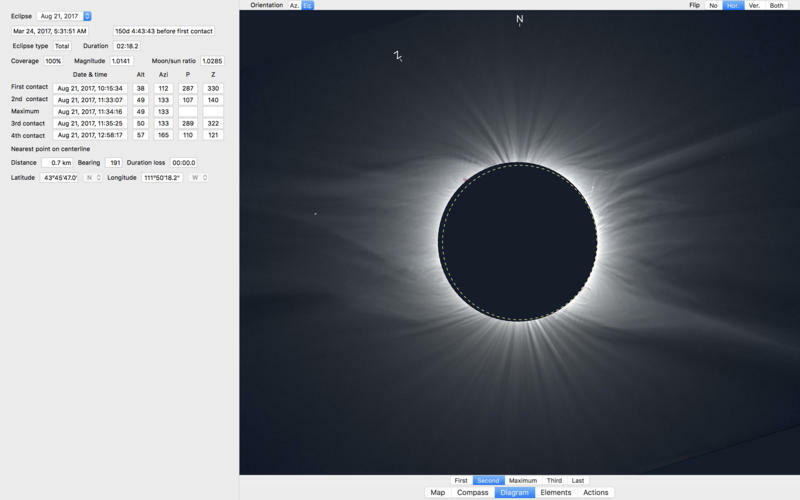 Sciatrope is an app made by an eclipse chaser for eclipse chasers. It helps preparing for, and observe, any solar eclipse. It gives the eclipse circumstances, distance and direction to the central line. Observing location is, provided by the macOS location services by default, or an external GPS device compatible with the NMEA protocol. 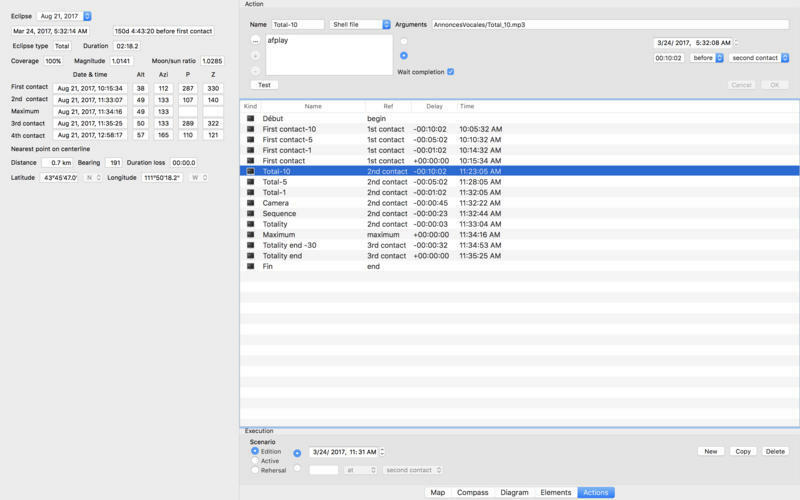 A table which displays the circumstances, and which allow to select an eclipse. Sciatrope needs a review. Be the first to review this app and get the discussion started! Sciatrope needs a rating. Be the first to rate this app and get the discussion started! The eclipse path, the central line, the northern and southern limits of the central eclipse. The eclipse path is refined when you zoom in. The azimuth of the eclipse contacts. 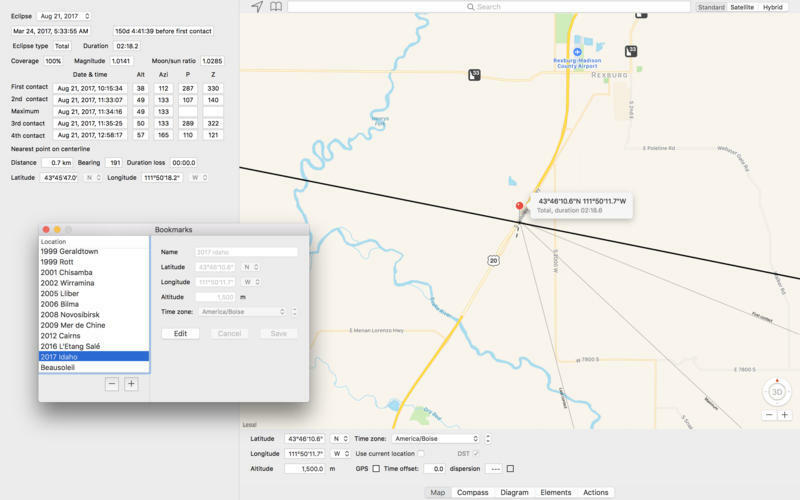 An information pane which allows to set the location by latitude, longitude, altitude, and timezone ; and has several other features. A search pane, to set the location by name. A bookmark pane where you can save favorite locations, and recall them. 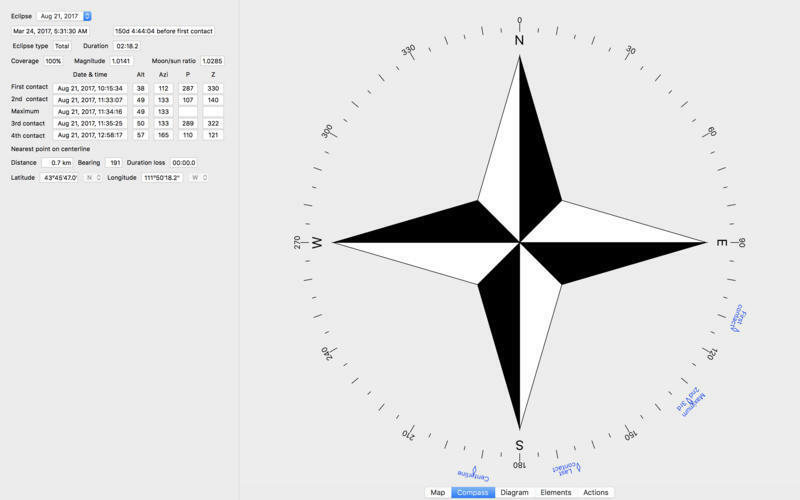 A compass which provides the azimuth of the eclipse contacts around you. Flipped horizontally, vertically, or both (or not flipped of course). For the experts or adventurous, eclipse Besselian elements can be modified, to take into account new updated elements, or experiment with them.